When Chef Kristina J. Addington told her mother she was going vegan, her mother genuinely broke down and cried. "I didn’t know how to comfort her," Addington says, recalling the moment that took place over 10 years ago, just 30 minutes east of Louisville in Shelby County, Kentucky. Through her tears, her mother wondered aloud who she would give all of her cookbooks to now -- certainly, she thought Addington would no longer need them, if she was going to stop eating animals and using all animal products. Eventually, Addington was able to show her family that it’s possible for a meal to be vegan and still have a truly Southern, down-home feel to it, and they’ve come around -- even her mom. These days, through Chef Addington’s V-Grit’s food truck, meal delivery service, and the restaurant they plan to open in the Portland neighborhood in spring 2017, she’s been part of a movement that’s showing Louisville and beyond what’s possible in vegan cooking. Vegan culture has always been a little fringe. Vegans have often been perceived as folks who clutch tightly to their morals, without much concern for appeasing the mainstream (or folks’ tastebuds). But that’s not what the vegan movement in Louisville looks like in 2016. Vegan chefs like Addington are making their meat- and dairy-free diet mainstream by appealing to diners’ desire for nostalgia -- but with a healthy twist. While the idea of crunchy, earthy vegan food may seem at odds with Southern comfort food, V-Grits has been able to bring the two together. "Biscuits and gravy was always my favorite food; my mom would make it every Saturday morning," Addington says. Unsurprisingly, her vegan version has been one of the food truck’s most popular items. "It’s heavy, thick, white country gravy." Just like Mom’s. V-Grits has also prepared a vegan variation of fried chicken. As Addington says, "It’s not that hard to replicate the texture of stuff like that if you put some effort into it." Of course, not everyone has always put effort into it -- this is a fairly new development in the world of vegan cooking -- and some diners are wary that dishes won’t deliver on the familiar flavors and textures they remember and crave. "I think food is more than just the flavor or the taste; it has that sentimental connection for people. We like mac-n-cheese because our grandmothers made it for us when we were kids," Addington says, explaining what may be the core of most people’s reluctance to go vegan. While the idea of crunchy, earthy vegan food may seem at odds with comfort food, V-Grits has been able to successfully bring the two together. 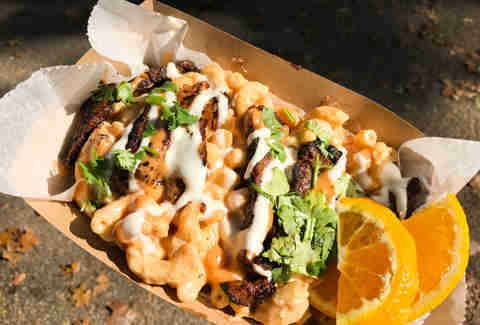 Their BBQ Steak Mac uses housemade cashew cheese, their own vegan steak strips, special sauce, crema, and an orange wedge -- to cut the richness of the dish. Their cheeses have proven to be so popular, they’re now available at Louisville’s Lucky’s Market and Half-Peach, a vegan bakery and café in St. Matthew’s, including their pimento cheese -- a true Southern classic. The best compliment is when non-vegan customers become regulars because good food is good food, vegan or not. When V-Grits travels to Vegfests, the vegan festivals that take place all over the nation, people are surprised to hear they’re out of Kentucky. The V-Grits team says they’re often asked, "Why Louisville?" "I want the challenge, and Kentucky needs it," Addington says. She believes that the challenge of making vegan food that feels familiar to Southern eaters has pushed her cooking to the next level. For Addington, the best compliment is when non-vegan customers become regulars because good food is good food, vegan or not. V-Grits even threw Kentucky’s first Vegfest in May, in the parking lot of Apocalypse Brew Works -- and more than 3,000 people came out. Louisville’s culture has also helped V-Grits grow. "People are really into locally-owned businesses and buying local here," Addington says. With V-Grits’s meal delivery service, which makes it easy for everyone to cook vegan at home, they’ve found that their clients have been choosing them over national competitors partially because they believe in supporting local business. 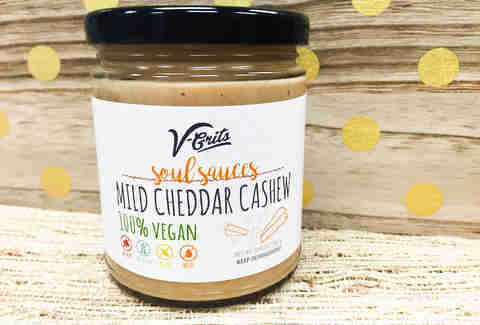 And that’s a good investment in developing local culture, because V-Grits is also committed to community building, from selling their cheeses at Half-Peach to working with the Louisville Vegan Jerky Company on a potential future menu item. Addington is also working with a young documentarian to help her with a class project about veganism in Louisville. Sarah Nichols’ mini-doc will premier at the planetarium this month. She’s a junior at the University of Louisville who opines that, for all the ways Louisville has changed in the last 10 years, the campus is still far behind, with no good options for vegans. As Nichols says, "Our campus is the antithesis of being vegan." U of L alum Sarah Baker described the campus as “a fast food wasteland.” Nichols, now a manager at Somewhere and server at Proof On Main, really got into fast food in college because of the lack of choices. After watching Forks Over Knives, she knew that a plant-based diet was the only way forward for her, "Because for me, it really exposed a lot about how directly correlated diet is to health in a way other than just weight." She said she wanted to avoid a future of "baskets of pill bottles" for chronic health issues and get her health on track. The film "examines the claim that most, if not all, of the degenerative diseases that afflict us can be controlled, or even reversed, by rejecting animal-based and processed foods." Although Nichols grew up in the Southern tradition of North Carolina barbecue, she doesn’t feel like she’s missing out on anything by choosing a vegan lifestyle. She calls the stereotypical image of vegans drinking wheat grass shots and eating alfalfa grass "antiquated." You can make anything vegan if you put your mind to it. 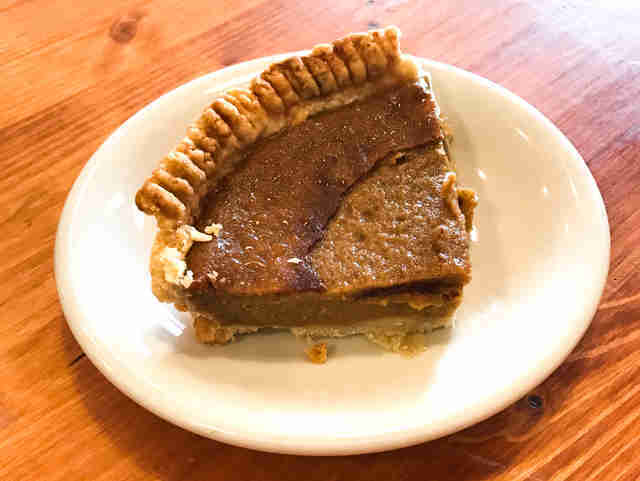 The vegan sweet potato pie is every bit as good as the traditional version; creamy and sweet, with bursts of cinnamon and nutmeg, and a crisp crust. Describing Southern veganism and how it differs from vegan culture in other regions like Southern California, Sarah says, "It’s really just been extracting the meat and the animal products from these recipes, and finding a way to use those traditional methods on our fruits and vegetables." Sarah is a part of the sugar-, oil-, and salt-free movement, but the focus of her cooking is still very Southern. "The point has always been to get a layered flavor profile with your vegetables. So there’s always been a lot of roasting and slow-cooking in Southern food, which makes it more savory because you’re really extracting all the flavor out of your food. Whether you apply that to meat or vegetables or fruit makes no never mind." Nichols might now be turning down the church plates laden with real fried chicken and vegetables cooked up with bits of fatback, but she can’t say no to sitting at a dinner table surrounded by friends and family. She’s found the strength to politely decline food from the host -- a huge no-no in the South -- and brings her own plant-based dishes to share. When trying to sway the non-vegans in her life, Sarah likes to start off with a bourbon-glazed carrot. 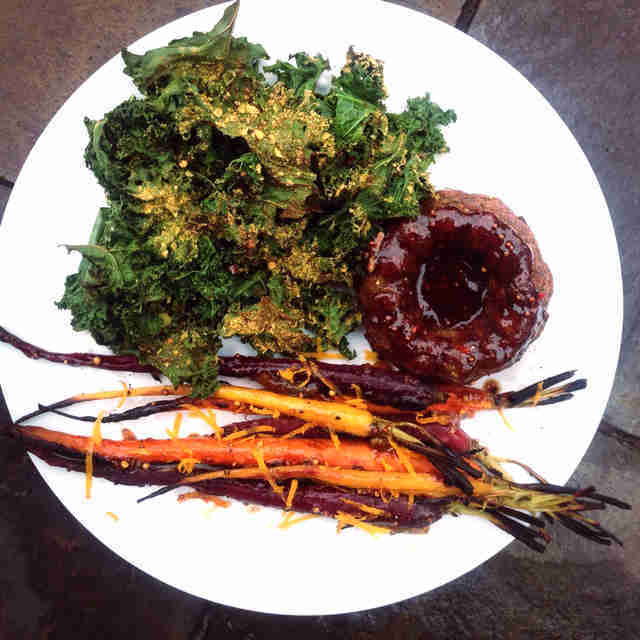 "Roast it a really long time, until everything caramelizes on it. Let it sit, so it gets really cool, and all of those flavors soak back into the carrot. Then you can grill it off pretty easily to get a little char, and to reheat it." Not only are vegan restaurants thriving in Louisville, but many local restaurants now have vegan or vegetarian-friendly items on their menu. Tina Gao, a 10-year vegan, moved back to Louisville last year. Right before she left New York, Tina tried a vegan fried chicken at an expensive restaurant -- and it was horrible. "It didn’t even live up to KFC,” Gao says. “I thought, Wouldn’t it be funny if we did a vegan fried chicken?" Since then, Tina and her mother, Chef Sue Zhao, launched Half-Peach Bakery and Café, which focuses on “international comfort food” -- and their vegan fried chicken is the best example of their cuisine. It’s a mash-up of the proprietors’ Southern locale and their Chinese heritage, drawing on classic Chinese flavors to season enoki and monkeyhead mushrooms mixed with soy protein. The whole thing is then wrapped in yuba, which acts as a soy-based skin -- and makes for that super-satisfying crunch that’s simply a must when biting into a good piece of fried chicken. 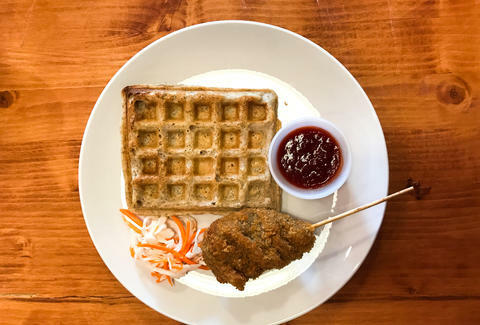 The dish was originally served with cornbread and a maple chili sauce with a side of pickled vegetables, but after listening to their customers, the duo swapped out the cornbread for vanilla waffles as a play on the trendy Southern dish, chicken and waffles. Zhao runs the kitchen, but as Tina says, "My mom isn’t a professionally trained chef. She’s my mom. The food she makes here, she makes for me at home.” Growing up near Tianjin in northeastern China, Zhao wanted to become a doctor, but instead, she became a computer programmer. In Louisville, she ran her own business building security cameras and big industrial machines. Or as she puts it, "I can build a machine that can fix a machine." She had no idea that although she hadn’t become a doctor, she’d still have the opportunity to make people feel healthier. Tina and Zhao made the choice to go vegan together, and Zhao began making vegan muffins and generously handing them out wherever she went. Soon, people were encouraging her to sell her baked goods, so she set up shop at farmer’s markets, and her goodies eventually made their way onto the shelves at local natural grocery chain, Rainbow Blossom. Still, customers wanted more. So in January, with her daughter’s help, she opened Half-Peach. Zhao says the name means several things: in Chinese culture, the peach is a symbol of longevity, and she says, "The inside represents your true heart." And in her heart is kindness for all – human beings and animals. There’s always been a lot of roasting and slow-cooking in Southern food, which makes it more savory... whether you apply that to meat or vegetables or fruit makes no never mind. Zhao learned how to cook from her own mother. Growing up poor in Tianjin’s countryside, her mother couldn’t afford to cook luxuries like meat and dairy at every meal, and Zhao still bases a lot of her dishes on what she knew as a kid. To ensure all of their menu items are free of preservatives and gluten, Tina says, "We make everything from scratch. We’re not trying to imitate fake meat. We’re trying to make something that stands on its own. We don’t even remember what the real thing tastes like!" Their dishes also have a Southern feel to them because they use all local ingredients. The bean patty uses black-eyed peas, which is a Southern staple, and they’re offering a sweet potato pie this season that’s every bit as good as traditional sweet potato pie. It’s creamy and sweet, with bursts of cinnamon and nutmeg and a crisp crust. They have several dishes that cater to Louisville’s growing community of folks who are not only vegan, but also sugar-, oil-, and salt-free for health reasons. In the future, Zhao would like to offer more special dinners and start hosting vegan cooking classes. Both Zhao and Tina pointed to a real sign of changing times in Louisville: not only are vegan restaurants thriving, but many local restaurants now have vegan or vegetarian-friendly items on their menu. Addington says she often sends out-of-towners to Feast BBQ in Nulu for their smoked tofu tacos (the tofu does share a fryer and a smoker with meat products). Tina mentions that Joella’s, a hot chicken chain with several locations around town, also carries a soy vegan patty. Bruce Rosenblatt, Ops Director at Joella’s, says his son, who has been vegan for over two years, inspired him to add a soy patty to the menu. 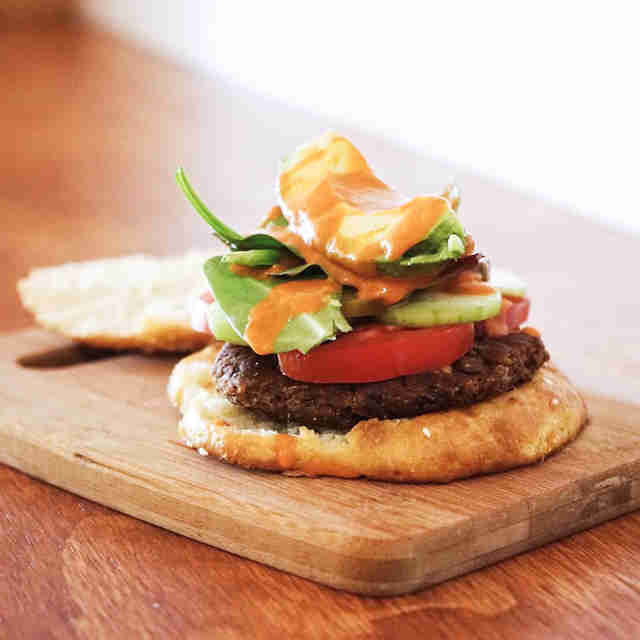 This vegan option is available in all of the same spice levels as their chicken, and the patty is breaded and fried in a separate fryer than their chicken. The team at Joella’s also plans to develop more vegan menu items in the future, as sales for their patty continue to grow week after week. Food is more than just the flavor or the taste... we like mac & cheese because our grandmothers made it for us when we were kids. Rye on Market’s garde manager, Adrienne Gallusser-Warner, has a long history with the Louisville’s vegan scene, and is excited about the ways it’s been evolving. Years ago, she was head chef for a vegan restaurant that ended up introducing meat products to their menu just to try to stay open, but which ultimately had to close their doors anyway. Gallusser-Warner understands the struggle. "I stopped eating meat fifteen years ago, after I discovered what veal was, but growing up in the South around comfort food, I really missed those flavors. Who doesn’t love mac and cheese, biscuits and gravy, pot pie, corned beef, stuffed cabbage, chicken fried steak -- not to mention the desserts! These are the foods I grew up with, the foods my grandmother and mother would cook for me. And I chose to sacrifice those foods for my love of animals." That is, until she learned to recreate them without meat or meat byproducts. "You can make anything vegan if you put your mind to it. I’ve made ‘chicken’ pot pies that were better than the real deal... I continue to surprise myself sometimes." Louisville’s vegan scene is creating an inclusive culture, and it’s making new traditions to hand down to the next generation. These chefs, restaurateurs, and everyday folks are grafting veganism onto old Southern roots, and developing this cuisine in a new, modern light. They’ve set out to prove that it’s possible to choose this lifestyle for your health, the well-being of the planet, or your love of animals, and still take part in the communal dining spirit that is essential to Southern comfort. Minda Honey hasn’t give up meat yet, but she sure thought about it. Follow her on Twitter & Instagram: @mindahoney.